It’s time to clean out your closets and get ready for our Spring/Summer Sale! What better way to do that than with the company of other consigning moms, parents and friends?! Let us help you prepare to earn MORE money in LESS time! Once your items are fully tagged, we will store them for you. No taking them home and bringing back! New to consigning? Let us help! Contact us today!! We are excited to announce our new MOTHER GOOSE CLUB!!! Mother Goose Club is a way to help families who wish to participate in our premier children’s consignment event but who simply do not have the time to consign. You can still enjoy ALL the benefits of reselling your items at Duck Duck Goose, while also shopping the new finds at our sale event! We’ll make it as easy as possible…you pick out the items you want to be included in the sale, bring them to us and we’ll take it from there. We are accepting items NOW, so you don’t have to wait until Spring to clean out your closets! Our Mother Goose knows just how to PRICE, TAG, and HANG your items to maximize the best potential profit at the sale! She does ALL the work, no sweat for you. After the sale, you can pick up your check for 50% of the selling price per each item sold, along with any un-donated items. Please contact us at louisville@dkdkgoose.com for more information with Mother Goose Club in the subject of your email. Availability is limited to our Mother Goose Club and on a first come first serve basis so secure your spot TODAY!!! Receive 50% of ALL items SOLD! Mother Goose Club will be accepting items for the Fall Sale until September 1st, but don’t wait, space is limited! There are the obvious things, like the fact that we waive most of your participation fee and enter your name into a drawing for a chance to win 100% of your earnings. You also get to shop early. Now, frankly, when we first started this event a few years ago, this wasn’t that big of a deal. The crowds weren’t too big, the line not that long and the deals did not go as fast. So if you came in to shop at the consignors’ sale, you were pretty good to go. But that is changing. The best deals (remember that incredible bike trailer for $25 last fall?!? Or the brand new train table with ALL the accessories that went for $75?!?) go to the workers who get to shop at 11am because they worked at least 3 shifts. And the best half price deals? 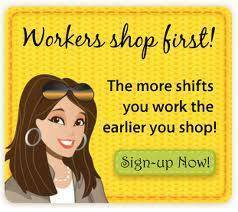 Those go to the workers with 4 shifts, or those who work a sorting shift, because we really need those workers, and we reward them with the opportunity to shop early on Half Price Day. The bottom line is: when you work at Duck-Duck-Goose, you get better deals. Another benefit to working a sale is that you get to spend time with people you didn’t know before. This might sound weird, but relationships are a big reason why we do what we do. We believe that God has called us to engage with others in a way that demonstrates Christ’s love and helps encourage them in their journey. We get the opportunity to hear the stories of cool things that are going on in our consignors’ families, as well as hear about opportunities to care for those families who are hurting and struggling. Our workers get to know a little more of that side of things, and it often serves to encourage them in their own efforts as they raise their children. For some, it’s simply an opportunity to spend 4 hours interacting with grown-ups for a change! Our workers often share tagging tipswith each other, parenting tips, etc. Best of all, it gives us the opportunity to get to know you better. Knowing who our consignors are, what’s important to them, etc., helps us to remember why we do what we do and how we can do it better. We often get our best advice/suggestions for improving the sale from our workers. The bottom line: Working at Duck-Duck-Goose can help build relationships, and relationships make our lives and the sale better!! We value our workers and each hour they give us is appreciated. We hope you will consider helping Duck-Duck-Goose continue to raise the bar for consignment events in the Kentuckiana area, and add a work shift when you consign with us this season! Earn 100% of your sales!!! Want a chance to earn 100% of your sales? How about a guaranteed 80% of your sales? Refer TWO new consignors to Duck Duck Goose and you will earn 80% AND a chance to win 100% . For every additional consignor you refer you will receive an additional entry for a chance to win 100%! Referred consignors must register and consign minimally 30 items! Referred consignors must be new to Duck Duck Goose! Mother Goose Consignors are eligible to earn 60% of their sales for 2 referred consignors AND a chance to win 100%! Let’s Play Duck Duck Goose! Duck Duck Goose is thrilled to be partnering with the Home of the Innocents. All donated items will be donated directly to the Home of the Innocents at our Spring sale! Check out other donation opportunities for the Home of the Innocents at the Spring sale!! In accordance with the new CPSC guidelines, we will not be accepting any drop side cribs at our upcoming sale. Unfortunately we will not be able to have any exceptions. Please review the CPSC guidelines if you have questions. Thank you!